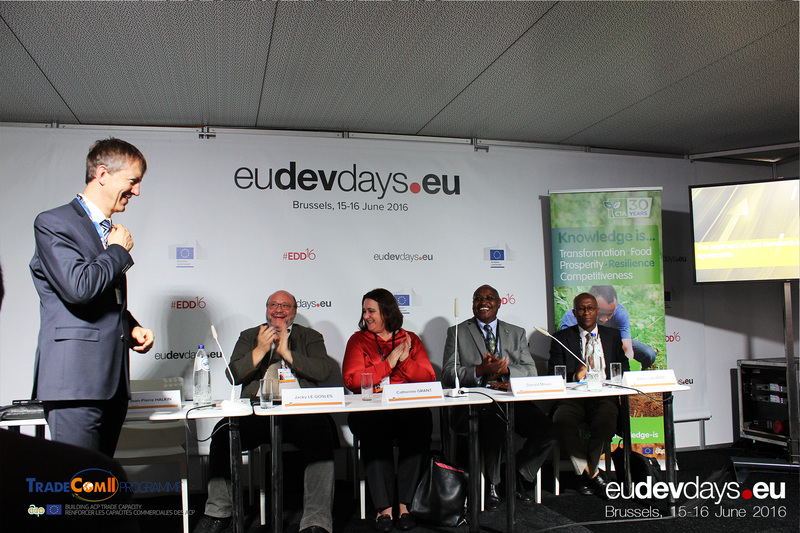 The tenth edition of the European Development Days (EDD 2016) took place in Tour & Taxi on 15-16 June 2016. 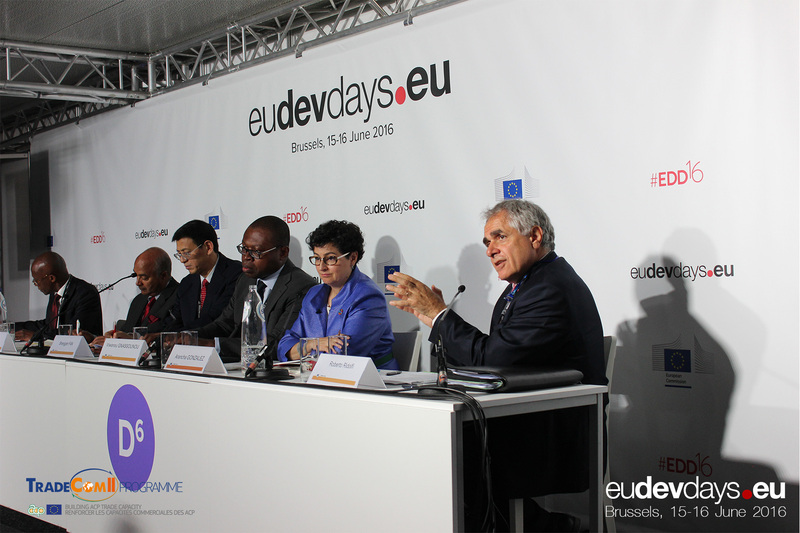 The EU-ACP Technical Centre for Agricultural and Rural Cooperation (CTA), TradeCom II Programme and the EU-ACP Technical Barriers to Trade Programme (TBT) jointly organised two debates at the EDD2016 on pressing development issues in the African, Caribbean and Pacific countries (ACP). During the first event “Developments in agricultural trade and the Sustainable Development Goals in African, Caribbean and Pacific countries”, panelists including Mr. Edwin Laurent (Senior Advisor, The Caribbean Green Economy Initiative) Ms. Arancha González (Executive Director of the International Trade Centre (ITC)), Mr. Daniel Gad (Managing Director, Omega Farms Ethiopia), Mr. Viwanou Gnassounou (Assistant Secretary General, ACP Secretariat) and Mr. Roberto Ridolfi (Director for Sustainable Growth and Development, DG DEVCO) debated the key issues relating to trade and the sustainable development goals as well as the role of agriculture and agribusiness for sustainable development in ACP countries. In particular, the discussion focused on the context of the 2030 Agenda for Sustainable Development and explored how key stakeholders could encourage nutrition-sensitive and resilient trade in agricultural goods. The panelists also provided an overview of how trade and development cooperation can be successfully partnered as an approach to achieve the Agenda 2030, particularly in the context of EU and ACP cooperation. They mentioned the importance of key achievements already met and future priorities for global stakeholders to ensure that the agricultural sector has an enhanced role in sustainable trade and development cooperation. The panel of the second event “The Treatment of Food Standards in mega-regional trade agreements” found the contributions of high level experts such as Mr. Jean-Pierre Halkin (Head of Unit, Rural Development, Food & Nutrition Security, DG Europaid, European Commission) Mr. Donald Mmari (Executive Director, REPOA - Policy Research for Development), Mr. Edwin Laurent (Director, Ramphal Institute), Ms. Catherine Grant (Research Associate TRALAC) and Mr. Jacky Le Gosles (Senior Expert, DG Health and Food Safety, European Commission), expressing their respective insights on what recent global trade developments mean for ACP development. The rules governing global trade are defined by mega-RTAs such TTIP (Trans-Atlantic Trade and Investment Partnership), TPP (Trans-Pacific Partnership) and RCEP (Regional Comprehensive Economic Partnership), with important development implications for the ACP in terms of full integration into global value chains, capacity to negotiate regulatory frameworks, and ACP producers’ ability to meet compliance costs, including tighter food standards. The two events were thought by all the participants to have been a great success in terms of participation and quality of discussion.